In 1911, Mrs. Margaret Cain generously donated $100 out of her life savings and an anonymous couple planning to wed in the new church donated another $50 for the statue of St. Patrick. 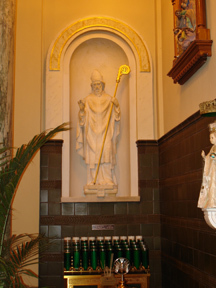 In 1925, the statue of St. Patrick was moved into the sanctuary where it is today. St. Patrick is the beloved and patron saint of the Irish who founded St. Joseph Church.